When on a budget, a reef tour with Compass Cruise is your best option for seeing the Great Barrier Reef. While there are many choices in different price ranges, Compass Cruise outshines all the other daily trips in the budget price range and even most in higher price ranges. However, being a budget reef tour does not mean it is a bare bones experience. The Compass Cruise departs from Cairns’ centrally located Marlin Marina for a five hour reef tour on the Great Barrier Reef each morning. Boarding time starts at 7:30 am and the Compass departs at 8:00 am for your day of sightseeing and snorkeling on the reef. Depending on weather conditions and the mooring site selected to be the first of the day, it is about an 2 hour trip to the first reef location. While some guest prefer to stay inside the air conditioned saloon, many guest head for the upper deck. The upper deck provides wonderful views of the reefs as you travel to your destination. Those wanting to work on their tans and budget their time, will find ample place to stretch out and gather in the rays while heading to the reef. The first reef location is generally on Hastings Reef. Hastings reef is one of the out reefs being the closest to the open ocean. Nutrient rich water wash over the reef from the deep water nearby each time the tide comes in. This creates an environment where the corals can grow to magnificent sizes. The coral and the nutrient rich waters leads to abundant marine life. You will find that the reef is alive with reef fish of all sizes. The deep water are also home of large pelagic species including turtles, rays, mackerel and tuna. These species also travel to the shallow reefs to feed on the abundant marine life. Snorkeling is included in the fare so no extra impact on your budget for your snorkeling reef tour. 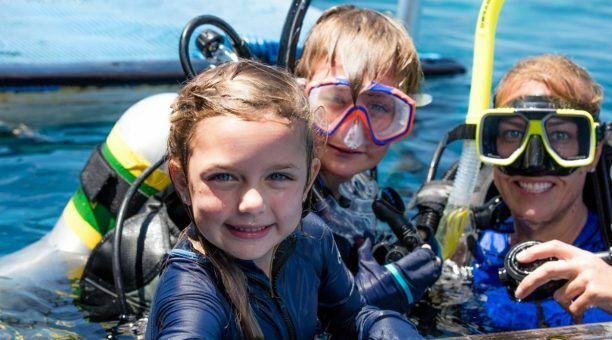 Certified scuba divers can take an optional scuba dive or two and those wishing to try scuba are able to take a resort dive that is also optional. While you are snorkeling, the chef is busy preparing lunch. Lunch is a tropical buffet that is prepared on board so that you are getting a fresh meal. While you are eating the captain will relocate the Compass to the second reef of your reef tour day. The second mooring site of the day will generally be on Breaking Patches Reef. Being a patch reef the seaward side is not directly exposed to the open sea. You will often find the water on this reef and in the shallow lagoon behind it as calm as a swimming pool. You will never find a swimming pool, however, that is the home of over 400 species of coral including coral trees and sea fans. There many times more species of reef fish than the 400 species of coral on this reef. After the afternoon snorkeling session and prior to heading back to Cairns, there is a special activity available called boom netting. A large boom net is deployed behind the Compass and those who wish to try find a place on the net and hold on. Once everyone is ready, the Compass starts moving and pulls the net and those hanging on to it behind them. After the boom net is secured and the Compass is headed back to port an afternoon snack of cheese and fruits are served along with a glass of wine. The crew and service they provide is one of the keys to Compass Cruises success. A quick look at review sites, such as TripAdviser, will show you that our past guest loved our daily trips and many of the reviews cite the crew as a part of the reason they enjoyed themselves. Sadly many of the other daily tour vessels treat guest as nothing more than a name on a manifest. The crew of the Compass does not believe in that. The crew members are all passionate about the reef and enjoy sharing it with visitors. They also understand that for most of their guest, this is a once in a lifetime experience and the crew want to help make it the best possible experience for them. To the crew, your not just another person taking the trip, to them you are a new friend just waiting to be met. Compass Cruise is a member of the Hot Getaways Group. Hot Getaways is a family own business that specializes in Australia holidays. In addition to booking vacations in Cairns and around Australia, The Hot Getaways Group also has the MV Reef Experience, an upscale daily snorkel and diving boat, and the MV Reef Encounter, a floating boutique hotel and Diving Liveaboard.